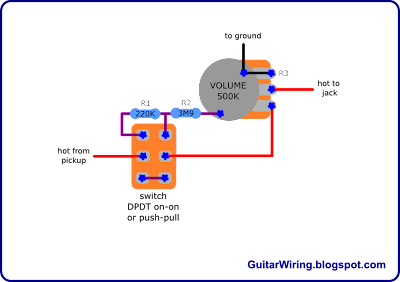 The volume drop switch is a guitar wiring mod , which can help you to reduce the output power of your axe, without significant treble loses. You can use it to make your tone cleaner, with less crunch from a tube amp, or just to decrease the volume, without treble bleed effect. It's a kind of a switchable voltage divider. In my example, it can reduce the guitar voltage to around 70%. This tune works well with my gear as a „crunch turn-off” with some small volume drop. How to tune it to your own preferences and guitar? You can do it by choosing the right values of the resistors. R3 is the volume pot resistance. It's in the parallel circuit with the R2 resistor. Together with the R1, they are the voltage divider - like a potentiometer, but not variable and with a really tiny treble bleed (almost like the volume pot on max). By increasing the value of the R1, the mod will be able to cut-off more volume. By increasing the R2, or decreasing the R1 value, it will be able to cut-off smaller amount of the guitar signal. I suggest to do not decrease the value of the R2, if you don't want more treble losses. For many of you, it will be good to test a few values and choose the best one. The example on the diagram can be a good starting point. However, if you like to calculate everything before you start testing and you like a little bit of math, this is how it works: http://en.wikipedia.org/wiki/Voltage_divider. According to my schematic, Z2 is the parallel circuit of R2 and R3 (calc: http://www.1728.com/resistrs.htm). When you will turn-on the voltage drop switch, you still will be able to use the vol. pot with good results. It gives a really good precision of the guitar volume control.